There is a clothing store that specialises in selling budget price clothes by not really paying the workers who make those clothes very much. And recently one of their t-shirts became very popular. 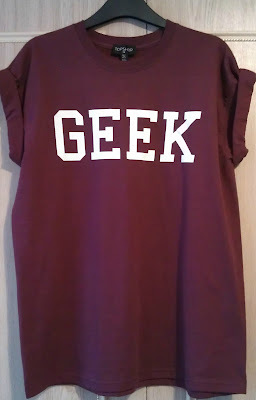 If you have been anywhere in the UK where there are teenage or 20 something aged girls you have probably seen at least one person wearing a T-shirt with the word “Geek” written across the front. (Most of those wearing it definitely aren’t geeks, but that is beside the point…). And I was walking through town the other day and happened to pass this store and a number of other stores and saw there were now other variations you could get. Blazers with the word “Nerd”. T-shirts with the word “Freak”. I even saw one guy wearing a hoodie with the word “Alone” (and from looking at him, he could be wearing that hoodie for some time…). By wearing these items of clothing people are essentially reducing themselves to a one word definition of identity. Some see themselves as geeks, which all of a sudden has become cool – I think The Big Bang Theory is single handedly responsible for that. Others, more concerningly, see themselves as freaks. Some define themselves by their relationship status. Some people find their identity in their job. Others find their identity in the music they listen to. But what about us? If we want to reduce our identity to a one word slogan we could wear on a t-shirt, rather than go for geek or nerd or freak, we should go with “Loved”. Romans 8:37 tells us “overwhelming victory is ours through Christ, who loved us”. Ephesians 1:4 reminds us that “Long ago, even before he made the world, God loved us and chose us in Christ to be holy and without fault in his eyes”. Ephesians 5:2 points out that “[Jesus] loved us and offered himself as a sacrifice for us” – we are loved! We are loved. Whoever you are, whatever you do, whatever your relationship status, no matter how rich or poor you are, you are loved by God, the creator of all things. You are loved. That is your identity. Chose to walk in that truth. Be defined by the fact that you are loved as you are today.